The City of Toronto owns one of the largest, most complex and valuable real estate portfolios in North America. In January 2018, the City launched a City-wide Real Estate Transformation project to address the diverse governance structures, program objectives, investment plans, processes, data and technology, skills and expertise between the over 24 City divisions, agencies and corporations involved in real estate activities. The new City-wide approach sets a mandate to strategically plan decision-making and outcomes in a coordinated, cost-effective way. The City has centralized authority for strategic oversight of real estate assets, placing a renewed focus on more comprehensive portfolio strategies and planning to establish clear investment directions, engagement and coordination of all City partners. In 2019, City Council will consider a report on a City-wide Real Estate Portfolio Strategy which will include an over-arching strategy and subsequent real estate asset and investment strategies, such as Office Optimization. In 2015, City Council approved a formal review of the management of the City’s real estate. The outcome of the review found an entangled system of governance and service delivery, which presented considerable challenges to achieving desired city building outcomes. 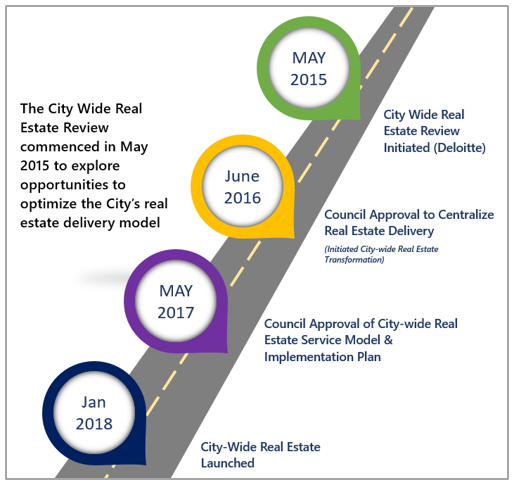 The City-wide Real Estate (CWRE) transformation streamlines governance, authorities, and coordination to manage the City’s complex real estate portfolio better and improve strategic functions, such as forecasting, prioritizing, identifying opportunities, and delivering integrated solutions that enable broader City strategies. Enhanced Asset Stewardship: centralizing governance and oversight of all City-wide real estate activities. The transformation is supported by a strong accountability and governance structure with City Council oversight, and built-in flexibility to operate in the changing marketplace and make adjustments to meet the City’s evolving and complex real estate needs. The new real estate operating structure centralizes and integrates real estate strategy, planning, and major capital project delivery into one City agency, CreateTO and will, where prudent, centralize day-to-day real estate transaction services (i.e. expropriations, leasing, sales) into one City division, Real Estate Services, and day-to-day facilities management (i.e. maintenance, minor office renovations), into one City division, Facilities Management. CreateTO provides a strategic City-wide approach to the delivery of real estate services that promote a balance of community and economic benefits. CreateTO, Real Estate Services, and Facilities Management have established an integrated real estate team that will work with City programs with significant real estate assets and functions, such as the Toronto Transit Commission, Parks, Forestry, and Recreation, Toronto Police Services, etc. to support the delivery of real estate services from long-term planning to execution. While real estate authorities for all City agencies, divisions and corporations, except Toronto Community Housing Corporation and Toronto Hydro, have been centralized, currently day-to-day building management and maintenance activities are still distributed across the organization. As the CWRE transformation project progresses, relevant operational activities will be centralized over the next three years, if deemed prudent (e.g., consolidate staff, budgets, & functions, as appropriate). The City of Toronto real estate portfolio consists of extensive asset holdings (8,446 properties and over 106.3 million square feet) plus significant annual operational ($1.1 billion) and capital ($1 billion) expenditures. As part of the CWRE Transformation, City Council directed CreateTO in collaboration with City staff to develop a City-wide real estate portfolio strategy for Council approval in 2019. The portfolio strategy will frame key opportunities to make the best use of land, capital and resources through strategic actions such as co-location, facilities modernization, land intensification, partnerships and asset rationalization (e.g. reducing third-party leases). Provide a roadmap for optimizing City assets classes over a longer-term phased approach. The City is also advancing Office Modernization and Optimization pilot, led by the Deputy City Manager, Corporate Services. CreateTO will recommend scaling the modernization and optimization pilot as part of the City-wide Portfolio Strategy in 2019. Six successful office modernization pilot projects have been completed, with two more in progress, in City-owned buildings. In addition to space savings and accommodation improvements, the pilot projects demonstrated clear improvements in organizational effectiveness by enhancing City culture, performance and employee engagement. Strategy and Governance: Strategic decision-making and forward-looking stewardship over the City’s real estate portfolio, based on robust data, analytics, and standardized practices. Centralized Service Delivery: A centralized business model that modernizes operations, invests in critical functions, required practices and processes, and pursues economies of scales leveraging the City’s purchasing power. Sustainable Financial Model: A sustainable financial model that provides a transparent view of cost and capital expenditures to ensure the value of the City’s assets are maximized, seeks impactful opportunities for long-term investment and maintains quality service and stewardship toward community services. Collaboration, Communication & Partnerships: Pursue creative partnerships, a strong culture of collaboration, and proactive engagement to ensure the required coordination to deliver high-impact city building outcomes. Talent & Expertise: Develop and elevate talent and expertise through the City’s practices, people and workplaces. Advancing and delivering city building projects that have a high economic, community, or cultural impact. Delivering transit-oriented development by working with partners to coordinate development that integrates the build-out of transit infrastructure with nearby mixed housing, business, and leisure spaces.